L: 68" x W: 40" x H: 42"
Includes left-arm-facing sofa, armless sofa and right-arm-facing chaise. This couch looks great until you use it everyday, I’ve had every cushion replaced twice and they still are not right, some are firm and some sink down, the back cushions completely lost their shape and the couch is only a year and 7 months old but looks like it’s 10 years old the way it’s deformed, I gave it two stars because it’s a great color and size and if I spend a half hour fluffing and arranging the cushions before company comes it looks good but once anyone sits on it the cushions especially the Chaise lounge cushion is sliding onto the floor and they all look lumpy and out of shape, very disappointed especially for the amount of money I paid, wish I could afford to replace this sectional! It has been a year owning this sectional. In the store couch seemed firm which is what we prefer since we have 2 very active boys. The salesman at the store said this couch is durable and perfect for children and we also purchased the insurance. Four months into owning this couch we started to see a lot of pilling. Feathers everywhere, we have to vacuum our living room everyday or the feathers track everywhere all over the house. Also the ends of the feathers prick you while you are sitting or laying. Couch is starting to loose it’s durability due from the pilling. If I knew that this couch was downed with feathers I wouldn’t have bought it. Constant fluffing. We like the oversized ottoman due to its firmness and it’s not feathers it’s some kind of foam. The couch is made from cheap wood it is so light I pick it up with one hand to vacuum underneath. Called Raymours claim service about the durability and feathers coming out all the time and they told me, only high end couches are feather downed and that it is normal for the pilling and they couldn’t do anything about it. Another reason to not buy this couch since it’s downed with feathers and the Chenile material makes you really hot with prolonged laying or sitting. We are really enjoying this couch. It's big and soft and comfy, perfect to curl up on. We originally were a little disappointed that we couldn't get it in grey to complement our blue/grey wall color, but when we got it into the room the couch seems to have some grey tones that came out and it works really well. If you want a soft, large couch - this is it. The material is super soft, neutral color so it will go with everything but not too light. This couch is big and comfortable. More than enough room for the family. This sectional is so comfortable and big! Can seat every person in the family comfortably! We also got the ottoman, which really compliments the sofa and adds more relaxation to the entire thing! Pillows that also come with, are a plus! This sectional is exactly what we wanted for our family room. It is so roomy and so comfortable! Although I just purchased this sectional, I am already in love with it. And, it has brought my living room experience with my family to a whole new level. I highly recommend this set! We just love the color of our Mosley 3 piece Chenille sectional sofa. We recommend it, it is soft and fits perfectly in our living room. Sofa is great for entertaining because it can seat so many people, cushions are firm but comfortable. We’ll see how durable the cushions are as time goes on. It’s amazing. So comfortable, we haven’t slept in our beds since! Awesome sectional! Service was great, had to refer a few people that were looking for new furniture and they bought some as well. Great product. I could not be more pleased by the purchase of this sectional. I love the color, the comfort, the size, just about everything. This is everything my wife wanted and more. Thank you for the excellent service as well. We are very pleased with the furniture we purchased. I got this sectional last week and so far we love it! It's soft & comfortable, with room for everyone to sit and/or lay on it, all at once!! No more arguing over seats! Nice pillows came with it too! Love, love, love it! Have been looking for a while and glad I decided on this! The whole expierence was AWESOME!! You guys ROCK!! In love with our new sectional! My wife and I are very satisfied with our new sofa! The delivery was even exceptional as well. The gentlemen were very careful of our new hardwood floor , and helped us put on felt pads on the feet of each sofa foot. Awesome experience from start to finish. Thank you guys, and Happy New Year....really changed our house for the better. Hello Kelly, we're very sorry to hear about this experience and would like to look into this for you. Could you e-mail your order details, contact information and a copy of your concerns to rfcare@raymourflanigan.com so we can better assist? Thank you! Definitely recommend this couch to anyone. Soft and comfy, cushions and pillows easily adjusted for style. Will this couch fit through a 31 inch doorway? Thank you Gina did they need to unwrap it to get it through?Enter a reply to GINA G.
Is it possible to choose a different upholstery for this sectional? BEST ANSWER: There was no other upholstery selection available for this set. I will have this delivered on Monday. The floor model did not have connectors on any of the pieces even though in the description it says they are included. The salesman called someone and asked and they said the workers just didn't put them on when they setup the floor model. Is this correct? I don' want my three pieces sliding all over the place and separating. BEST ANSWER: Yes there are sectional connectors included. 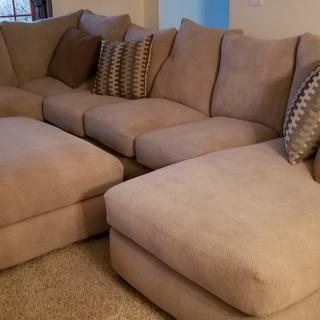 Mine had no connectors and the deliverymen said this sectional does not have them. Sliding all over my wood floors. I purchased this sectional, 3 pieces, one armless couch, 2 chaise. There were no connectors and the deliverymen told me none are included with this set. The description says they are. What is the correct information? BEST ANSWER: Hello, Veronica! Thank you for your inquiry regarding the Corinthian Mosley 3-pc. Sectional. The connectors are to be included with this set. We are very sorry to hear of your experience thus far. Our customer care team is always available and will answer any questions/concerns you may have. Please call the customer care 1.866.383.4484, option 7 for further assistance in regards to your experience. BEST ANSWER: The Mosley is available only in Taupe, as shown on the website. What are the size of the complementary throw pillows? BEST ANSWER: The dimensions of the decorative throw pillows are 24" x 24"
Can the chase be placed on the left side as you're seated? BEST ANSWER: Yes. For assistance in selecting individual pieces to configure the Mosley sectional for your space, please call 866-383-4484, option 2. Can I purchase the sectional without the chase? BEST ANSWER: Yes. For assistance in selecting individual pieces to configure the Mosley sectional for your space, please call 866-383-4484, option 3. Anybody have a pilling problem with this material? BEST ANSWER: The Mosley Sectional includes a 100% polyester chenille upholstery. Pilling has not been an issue with this collection. Are back cushions removable or sewn into couch? BEST ANSWER: The cushions are removable and reversible.